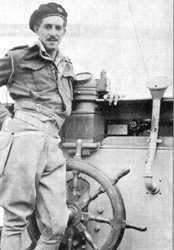 MAJOR DENNIS CICLITIRA, who has died aged 81, was in charge of SOE’s operations in western Crete during the Second World War and eventually arranged for the German surrender of the island. Ciclitira arrived on Crete just before Christmas 1943, taking over supervision for the area around the town of Canea from Xan Fielding. Liaison with the Cretan Resistance was led by the classicist Tom Dunbabin, who from the spring of 1942 had been supervising the activities of a handful of SOE officers, among them Patrick Leigh Fermor, who were living rough with the andartes or guerrillas in mountain eyries. One of Ciclitira’s first important tasks was to help to organise the evacuation of Leigh Fermor after he and Billy Moss had successfully abducted the commandant of the island, General Kreipe, from his staff car in April 1944. In his book Ill Met By Moonlight (1950), Moss describes encountering Ciclitira in his cave hideout. Two of Ciclitira’s men had already been killed by the Nazis, but despite their strenuous efforts to catch him, he managed to maintain wireless communications with Cairo and to arrange for Leigh Fermor and his prize to be picked up by motor launch. When he arrived at the rendezvous he found Moss and Leigh Fermor flashing their torches out to sea in frantic desperation, as neither knew the Morse Code for the pre-arranged signal. Fortunately, Ciclitira did. Ciclitira left with them on the boat, but subsequently returned to Crete, where he operated under the codename Dionysios. In January 1945, the German garrison of 12,000 began to withdraw to the western end of the island, taking with them prisoners who included Costa Mitsotakis, later the Prime Minister of Greece but then an agent for the Resistance. The Germans had orders to execute all such captives, but Ciclitira managed to contact the German authorities with a view to making an exchange of prisoners. Ciclitira went to the meeting with Captain Lassen of the Special Boat Section, who soon became exasperated by the horse-trading and suggested that his commando unit, who were hiding in the mountains, should play the Germans at football, with the winner to take all. This suggestion greatly amused Bishop Xirouhakis of Kydonia, who was mediating at the talks and offered to act as referee in any such match. In the event, after Ciclitira had travelled by caique to Athens for further discussions, 36 German PoWs were exchanged for 10 Cretan agents, probably saving their lives. On May 8, Ciclitira received a message to contact General Benthag, the German commander, to make arrangements for a formal surrender. Dressed in suits, he and Mitsotakis – a fluent German speaker – presented themselves at Benthag’s headquarters. Preliminary terms were then agreed, but since the general could only surrender to an officer of equal rank, it was decided that he should be flown to the British HQ at Heraklion. Benthag asked how Ciclitira proposed to contact his senior officer, and was most put out to discover that Ciclitira’s transmitter was hidden next door to German HQ, where the volume of radio traffic concealed Ciclitira’s own signals from direction-finding cars. The next evening, although the surrender had not been made public, Ciclitira and his comrades sneaked into Canea and invited their German counterparts to a party; the garrison provided them with a jazz band. The next day, Ciclitira joined in the wild celebrations that greeted Liberation. Read the full Telegraph obituary. This entry was posted in Ill Met by Moonlight, Obituaries and tagged Crete, Dennis Ciclitira, Dionysios, Ill Met by Moonlight, Major General Heinrich Kreipe, Patrick Leigh Fermor, Special Boat Section, William Stanley Moss, Xan Fielding on April 14, 2010 by proverbs6to10.